The Single Title Screening Licence (STSL) allows the screening of films on a Title-by-Title basis to audiences in a range of venues and establishments across the UK. Typical STSL customers include film societies or community cinemas, PTAs, Outdoor Festivals and Art Centres. With this licence, and subject to approval, customers are able to charge ticket admission and advertise their screenings. Take advantage of our 'Special Release' titles. You can show a film from as early as 8-12 weeks after the UK cinema release date and before the Home Entertainment release date. Filmbankmedia's catalogue includes over 13,000 films. Discover our full catalogue here. Any questions? Take a look at our FAQs. Consider hosting your event outdoors to attract larger audiences. Select from a series of booking options to determine your licence fee. 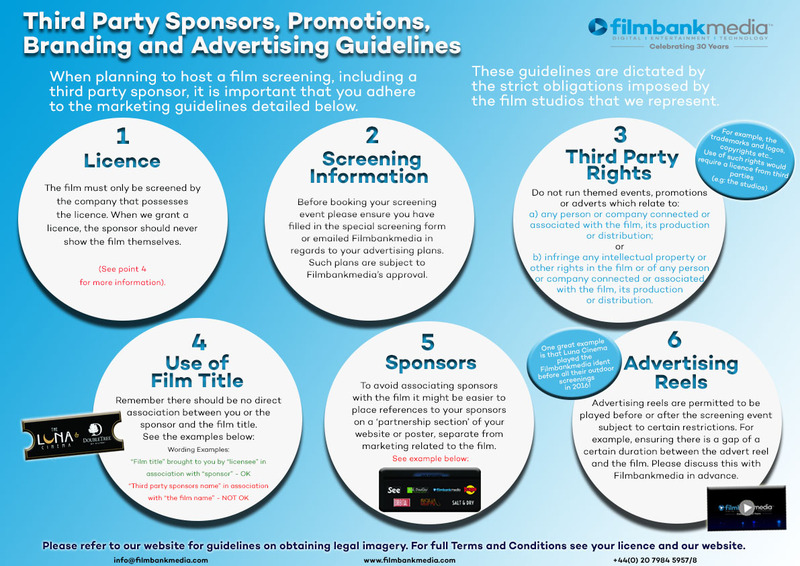 Under UK copyright law, screenings films to audiences outside of the cinema or home for entertainment purposes requires a licence from the copyright owner or their representatives (such as Filmbankmedia) before doing so. IMPORTANT NOTICE: Themed activities which are directly linked to the films are not permitted. Examples of themed activities include the use of characters, scene re-enactment, live music performances and any other activities that use elements from the film. For more information please contact us before you book your film. Click here for a full list of participating studios and distributors for the STSL. With our Image Bank tool, our STSL clients can download movie posters directly from the Filmbankmedia website for free. Simply find the film you need, click on "Download Poster" and register. Once your Image Bank account is activated, you will be able to download approved and official posters to promote your screenings. For more information about Image Bank, take a look at our Image Bank User Guide. Filmbankmedia is committed to ensuring the widest selection of content reaches the widest audience possible. Our close relationship with the Film Audience Network (FAN) helps us achieve this goal. We are proud to represent a rich collection of titles that FAN members may be interested to screen. Take a look at our LGBT titles, youth movies, black cinema, and mental health awareness related films. No deposit required from CFA members who set up an STSL account with us. APPLICATIONS FOR THE INNOVATION FUND 2019 ARE OPEN! The Innovation Fund offers a funding opportunity for film societies and community cinemas. Find out more.